A memoir of leisure, looking, and artistic expression. 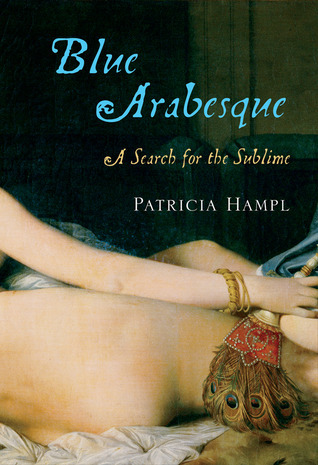 Blue Arabesque: A Search for the Sublime by Patricia Hampl. Harcourt, 215 pp. A painting must depict the act of seeing, not the object seen. Even if that object represents an entire exotic world, it must pass through the veil of the self to be realized—to be art. For it is the artist’s fully engaged sensibility—mind/heart/soul—that is really at stake for modernity. For all the critical complaint about the narcissism of modern artists, the twentieth century demanded self-absorption of its great ones: Don’t give us your skills, give us your attitude. Motifs in Blue Arabesque include North Africa—whose mythical odalisques (concubines) captivated Matisse and some fellow painters and sent them across the Mediterranean to see—and the French Riviera, where Matisse and other aficionados of languid women did much of their work. It’s where the odd filmmaker moved from frigid St. Paul, where Mansfield wrote some of her most famous stories. And where Hampl, having paid a call in Turkey two chapters before, visits to write in middle age. Wrapping up the book, she’s as well a humble, foot-sore, loafing tourist. She pays a call to Matisse’s late creation, a chapel near Cassis, where she meets his last muse, now elderly and a nun. I’ve been here off season, which makes Cassis and all the towns I’ve visited along the Riviera these past months seem old fashioned because empty, the social world slow enough for conversation, for banter, for the sitting-and-staring that is the core of living: the just looking of the artist life. . . . Sitting here, a person without any employment except to look. I have an uncanny sense that all things here in this light, the world itself and all its haphazard parts, have a way of coming together to form something—the sun, the lick of the morning air off the sea, shopkeepers leaning on big brooms, gulls sweeping the sky, the ruined medieval chateau on the crown of the bluff across the harbor almost effaced in the light, insubstantial but enduring like the past as it recedes and enriches itself in the mind. That lovely final sentence of 82 words shows as well as anything how rich Blue Arabesque is in implication. Which lends it a painterly quality, this unified work of art about one writer’s love of artistic expression. With a deft touch, Hampl has created a book as beautiful as its title. Something that I noticed, I think, is that “Blue Arabesque” contains not just a present moment of contemplation, but a past one as well. 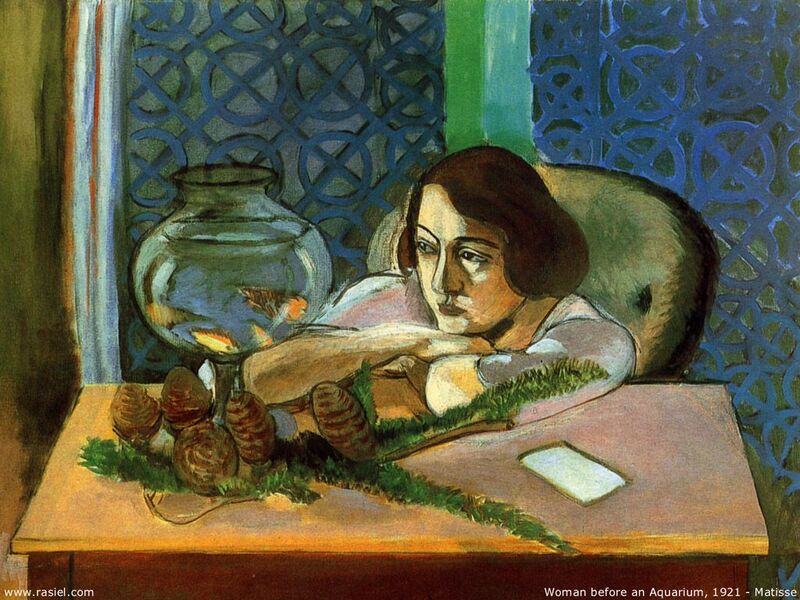 The woman’s eyes are not actually fixed on the fishbowl, but skew a little farther to the right, as if she was at first staring at the fishbowl in contemplation and then the contemplation itself became all-consuming and caused her to veer her eyes away a little more. It’s intriguing to wonder what she is thinking about, and something that I can well see occupying other gazers at her herself, in galleries and the like. Sort of the ultimate reference to a reference to a reference, if you see what I mean. Yes! I think you are exactly right, Victoria. I see it now, in this large image. And I’ll have to return to the book now to see if Hampl herself emphasizes this aspect; she certainly discusses this painting in terms of musing and leisure rather than the woman being fascinated by goldfish . . . Yes, I suppose were she to be actually staring at the goldfish themselves, she’d have to be a cat, not a human! Depending on the duration! Few humans, surely, can maintain a cat’s focus on fish. Love the comment exchange above. Very perceptive. Hampl’s writing is lovely, but it sounds a bit ethereal. I suspect I might prefer her memoirs to her “memoiristic” essays. Love the Matisse painting and, as always, I’m grateful to you for pointing me to things I might otherwise not know about, Richard. Aw, give Blue Arabesque a try, Shirley. It’s more unified than an essay collection. The subject is inherently ethereal, and so is the overarching narrative, but the prose is always grounded. If that makes sense! My first literary crush was on Patricia Hampl — I’ve read everything she’s published (beginning with her poetry; I used to go out of my way to hear her read her poetry). She happened to be on sabbatical from the U of M (taking advantage of her Macarthur award) while I was studying there, otherwise I would have been sitting in her classes with that “I want to be just like you when I grow up” look on my face. Her influence was deeply ingrained in the English department and we all talked about what she’d say if she were here (in Minneapolis) instead of in Prague. Blue Arabesque was, to me, something like Rilke’s Letters to a Young Poet. I kept both by my bedside for a number of years, (and yes, I read them, too! ), hoping to absorb their insights. And when I re-read both of those books, these 20-some years later, I realize–they were definitely major influences! But I like all that ethereal stuff. And I do manage to spend a good part of every day “looking and musing.” I had forgotten that line. I think I’m going to have to find a way to put something like that on my business card. Maybe Professional Ponderer? I’d forgotten your enviable roots in poetry, Tracy. And what a fine pervasive influence, if indirect, to have in Hampl when you were a student. If one insists on a strong this-happened-and-then-this narrative, Blue Arabesque might not suit—but who wants that for every book? Not me, though I’m a sucker for narrative, and I loved her subtle use of herself as a background narrative to her foreground musing on art and its creation. Love Hampl. Thanks for alerting me to this new book. The subject is so important for writers- giving ourselves permission to look- really to fully immerse ourselves in the senses –which is key to informing our world, our thoughts, our writing. Thank you, Richard, for the wonderful review. When I read it, something clicked in me – I borrowed the book at the library and loved it. 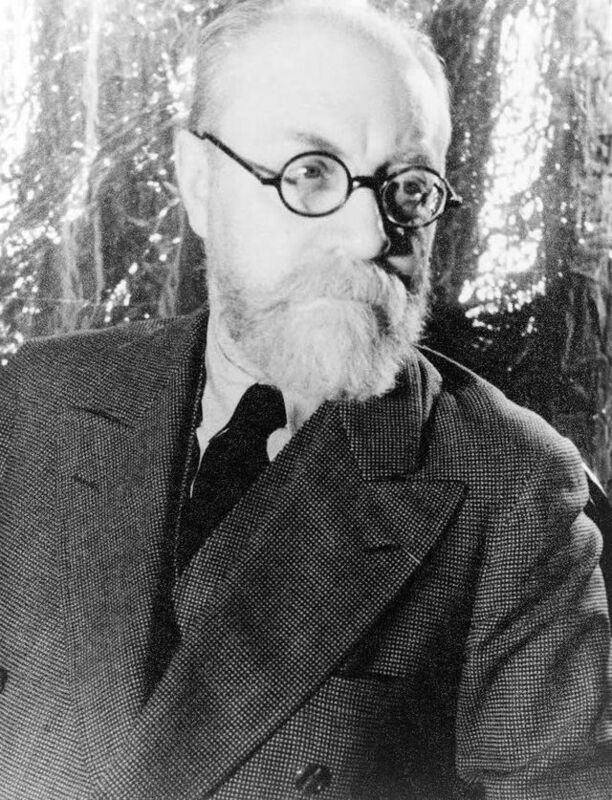 After that, I read a collection of Mansfield’s short stories with much delight, and now is thinking of re-reading the Hampl’s memoir – simply can’t part from it. Your post was like a gift for me – a good month of reading and musing. Thanks so much, Olga. I have only read a few short stories by Mansfield and was impressed! Glad my review and references panned out for you.